Jim Kircus, a good family friend would host an annual crawfish boil. Prior to his passing at the request of our then toddler girl, he blessed us with his life long secrets. As he always said- NJoy. Cover large table with newspaper and as foods are done SLING onto the table and gather round. It's nice to have a recipe remember someone by. I love crawfish boils. 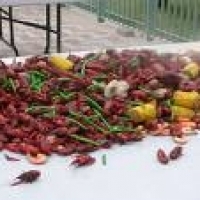 In Biloxi we used to have our annual crawfish festival. I have an interesting story when I was in labor and on the way to the hospital stopped to eat a boil because I knew I would be eating ice chips and was craving them. LOL My cousin still tells that story. Like skyduchess's recipes? Never miss an upload!